It’s been almost two weeks since we returned from Summerdance at Nelson Ledges Quarry Park in Ohio, and we’ve finally decompressed enough to make some sense of it all. CLICK HERE FOR DISCOUNTS ON OUR SUMMERDANCE BOOTH MERCH! After years of attending this wonderful oasis of bliss as campers, this was the first year we setup a booth. Our fearless leader and spirit animal Gary Wheat, carried the bulk of the burden in getting our stuff there with the aid of Big Steve’s trailer. Usually, we only have to worry about making an amazing campsite for our friends, however, the Summerdance game got flipped to expert level and we had to setup a booth AND a campsite. This set off a chain reaction which passed the baton of “Leisure Lounge Lord” to the more than capable Dakota. While he was stressing at first, it worked out beautifully (we’ll get back to that later). At the Leisure Lab, our core values are Lasers, Leisure, and Love. As you’ll see in the photos there were a lot of lasers needed to make everything look so leisurely. So the onslaught of rain that greeted Gary, John, Anthony, Mike, and Andra on their arrival required a lot of mother-loving fortitude. But they pushed through it and set up an amazing booth. This prepared us for all the early birds...or should I say, “premature pigeons” that got there before Thursday night so they could catch an epic set from Pigeons Playing Ping Pong. “That’s a Paddlin’” in honor of the old curmudgeon from the Simpsons. And the Disco Slice, which was a tribute to our favorite Pizza place in Ohio, Disco Pizza. I know it might be cheesy, but people seemed to love it. A good portion of our crew had disco sauce running through their veins for most of the weekend. Anyway, as you can see our booth was set up perfectly for prime Pigeon perusing. Artist and fellow Leisure aficionado Sam, showed up right on time to present Gary with a custom Pigeon costume for the occasion. Damn that’s fly. Sam also came with her custom made LIVING jewelry. That’s right folks, that beautiful plant on the charm is alive. That’s heady as fudge. The Festy Gods repaid our earnest energy with a dope treat. Pigeons unveiled their new jam Snake Eyes, which your humble writer got himself lost in. People seemed to love our booth, and Thursday ended up being one of our most successful nights. Our friend and best customer Kevin was lucky enough to get the lit af Poseidon's Egg Leisure Frame. While Kevin made us feel like stars Thursday, he was the real hero Friday night. Not only were him and Leisure Lord Dakota killing it in their Space Jam costumes for our Space Disco theme night, but he made a chicken wing dip that was truly out of this world...keeping with the space theme of course. Where there’s stars, there’s angels and our leisurlian Holly was a Leisure Angel on Friday celebrating her birthday. She usually lights up a room, but this was ridiculous. Lotus was matching in splendor and ridiculousness. Between two sets they spelled the word “S-U-M-M-E-R-D-A-N-C-E” with their setlist. The most splendid thing about the weekend though, was the weather. Although it rained Wednesday and Monday, the sun was shining every day in between, making taking a dip in the quarry the perfect cure to all ails. This is a huge part of what makes Summerdance magical. We wouldn’t be a true Leisure Lab if we didn’t have a proper raft for the occasion. Saturday was circus theme day, and the lab came proper I must say. I got the night started with my famous Summerdance chili. The limes I squeezed over the chili weren’t the only acid accompanying the dish. Let’s just say Saturday got a little nutty. Just like the shirt and boxers I wore under my peanut costume, I shed myself of all the problems and anxieties I’ve accumulated over the year. By the end of the night I was just a chestnut roasting by the fire, content with my nuttiness and assured everybody saw my nuts over the course of the evening. Anthony was an elephant in search of nuts. Gary and Ricki were the ringleaders of our nutty circus, and Andra was our mysterious fortune teller, accent and all. 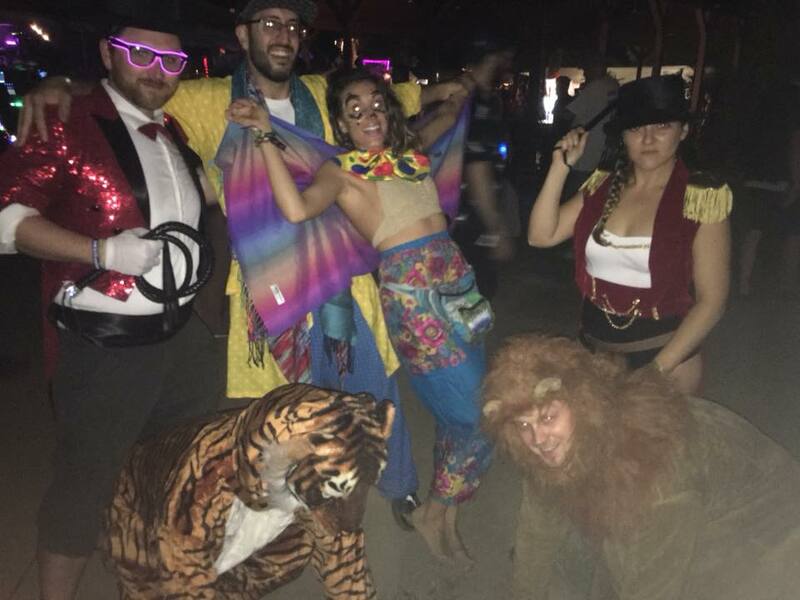 Dakota dressed like the king of the jungle he is, and the rest of the crew came proper as well. Not as proper as Lotus came, though. They busted out some rare Grateful Dead instrumentals in the first set, then played another scorcher comprised of a fantasy setlist submission. The band held a contest on Facebook, and did an awesome job realizing one lucky fan’s vision. Sunday Night’s theme was Purple and while everyone crushed it, Carrie and Lupa stole the show. On Sunday the Magic Beans took us to church before Consider the Source came through to blow minds with some of the sickest technical guitar skills I’ve ever seen in person. Nate and I stood by flabbergasted by the beauty of the moment. 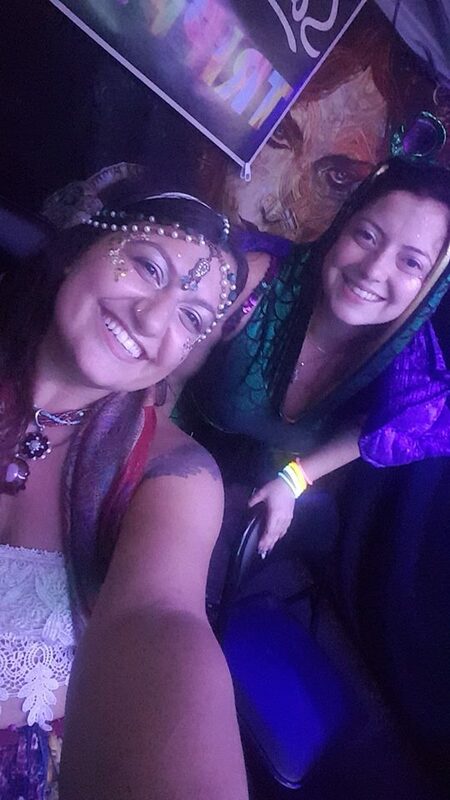 It was our first festival with a booth and we couldn’tve asked for a better one. Thank you to everyone, especially Big Steve and Lisa for getting the trailer that allowed us to up the Leisure game. 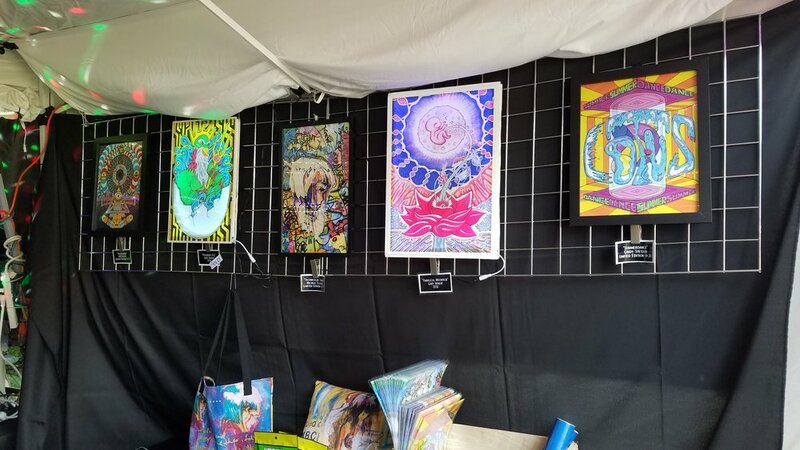 Thank you to all the artists that made our booth special: Gary Wheat, Steven McCorry, INCEDIGRIS, Michele Tucker, Cindy Louwho, Lupa and her headdresses, Samantha Giuffre, Jill Dauphinais, and Eloh Projects. Thank you to everyone who helped with setup and tear-down: Nate, Andra, Anthony, Steve, Big Steve, Lisa and everyone else. Big shout out to the whole Leisure crew from Buffalo to Baltimore and everywhere in between. You made our first festival as a lab special. SMD, is an emcee, producer, engineer, and CEO of The Leisure Lab. His influences include MF DOOM, Madlib, Wu Tang Clan, El-P, and Dilla. He has dabbled in Drum and Bass production and also MC’s Drum and Bass parties on occasion. Older PostSummerdance 2018: Exclusive Drops & Theme Nights!